StockMaster Mezzalift is a cost effective goods lift for mezzanine floors and other elevated work and storage areas. Using a simple winding mechanism a single operator can easily move items weighing up to sixty kilos. A reliable manually operated winch automatically brakes the load when the winch handle is released. Maintenance costs are minimal and there is no down time for charging of batteries. The dangerous practice of carrying items up or down a ladder is eliminated and the lift table can be positioned to allow a constant working height for positioning of stacked loads. The StockMaster Mezzalift goods lift for mezzanine floors improves safety and is easy to install. Mezzalift is fast and simple to install with fixing required at only two locations. A high visibility safety rail system is provided at ground level to eliminate the possibility of standing under the Mezzalift lift table. Mezzalift has an adjustable section at the floor level to ensure correct operating height at the mezzanine floor. 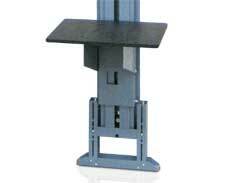 The length is adjusted to place the lift table at waist height for easy loading and unloading. StockMaster Mezzalad provides for personnel access to the mezzanine floor and goods can then be transport to the mezzanine floor using the Mezzalift. The combination of these products also provides the opportunity to make use of space above factory offices and tea Rooms etc. 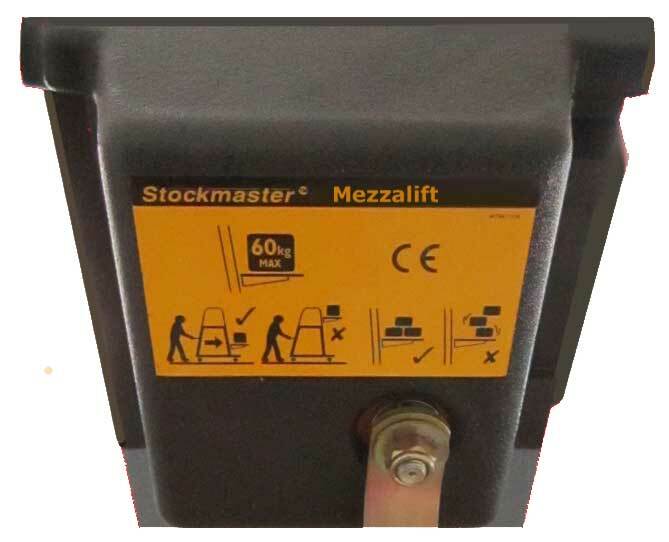 StockMaster Mezzalift manual goods lift . . . 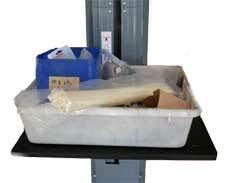 Provides safe easy goods transport to Mezzanine floors and space above offices, tea rooms, etc. A reliable manually operated winch transfers loads up to 60Kg. Mezzalift adjusts in length to suit the height of the mezzanine. For safe transfer of small items always use a picking bin.